This article is based on a keynote presentation that the author gave at the FIG Working Week in Athens in May 2004. It presents viewpoints in a popular form. It should not be read as a scientific study. The surveying profession is rapidly changing. From playing a key role in understanding, exploring and opening the lands and seas of the World; now almost everybody can make real time precise positioning and machines can make accurate maps. The science of geodesy and mapping will not disappear, but far less academics founding their core activities on those skills will be needed. At the same time management of land and waters is coming very much on the agenda as crucial to environmental sustainability as well as to social and economic development. Changing from geodetic engineers to administrators and managers of land and property, the profession has a golden opportunity to maintain its role in society. 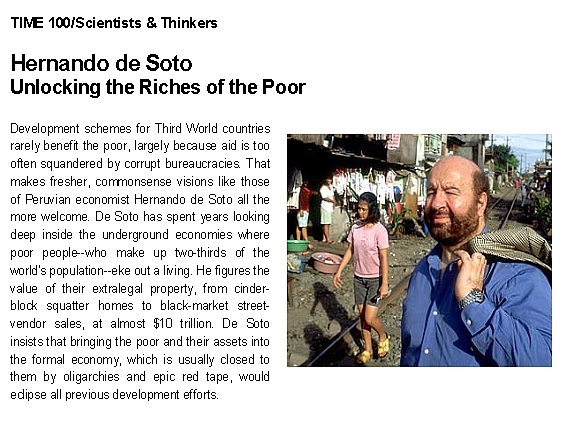 Particularly this has over the last decade been highlighted by the Peruvian economist and writer Hernando de Soto. 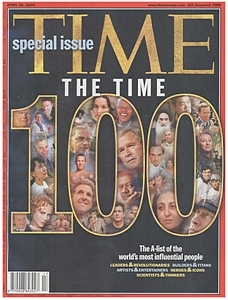 In the Time Magazine of April 26 2004 the Peruvian economist Hernando de Soto was nominated one of the 100 most influential people of the World. ”I predict that in the next 150 years the countries in Latin America and elsewhere joining these 25 (countries with a developed economy) will be those that spend their energies ensuring that property rights are widespread and protected by law, rather than those which continue to focus on economic policy. De Soto’s messages, not least through his book “Mystery of Capital – why capitalism works in the west and nowhere else” has raised the awareness throughout the World of the role of widespread, secured and tradable property rights in combating poverty. De Soto underlines that registered property is the fundamental resource for capital formation, and not only by being used as collateral for mortgages. It has far wider impacts, such as providing people with recognised addresses to which suppliers of public services can relate their bills – thus facilitating investments in water supply and other basic services. Formalising property rights are not only about freehold titles. As long as the rights are registered and thus made tradable a range of tenures can support capital formation. However, registration of the property objects and the related rights are not enough to achieve the overall objectives. In addition people and businesses must be enabled to act in the property market. Particularly for small and medium size businesses, company registers are essential to enable them to use property as collateral and otherwise act in the property market. 3. WHAT IS A GOOD PROPERTY SYSTEM ? Fair distribution of land is still a big issue in many countries. Almost all countries have some sort of registration system, but in very many countries the poor does not in reality have access to the registration services and are forced to transact outside the formal system. Probably no more than 25 – 30 countries in the World have property systems that fulfil all the above criteria. To join the 25 to 30 countries the infrastructure supporting formalisation of rights and transactions in land and property must be transparent, simple, fast, relatively cheap, reliable and free from corruption. Most West-European countries have well functioning property systems, but not all existing systems are optimal. Most countries have completed electronic registers and digital cadastral maps. Further modernisation is possible and desirable, but it seems difficult to break with old traditions. There are some examples of introducing a single agency responsible for the cadastre as well as the land register. In addition to UK and the Netherlands who have had an integrated registration service for many years, Italy has made a corresponding and impressing reform, and Norway and Iceland has recently started to transfer the land register from the courts to unify it with the cadastre authority. 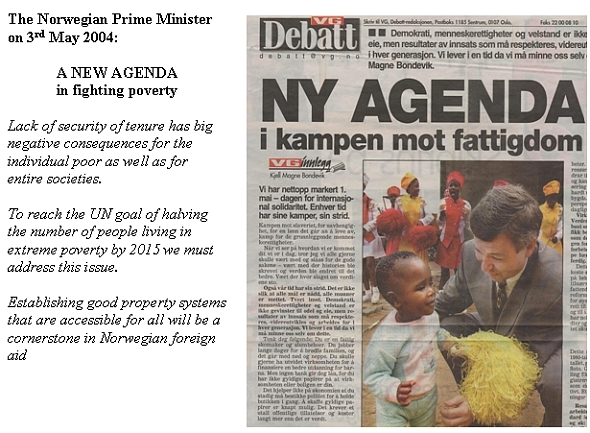 The other Nordic countries are currently all considering reforms in the same direction. On the other side, there are no examples of removing the monopolies of notaries in West-European countries that have a notarial system. Little is implemented so far in respect to electronic documents, but it will certainly be introduced during the next 5 - 10 years. It will have a big impact on the organisation of the cadastre as well as on the land register. Countries that decide to maintain the land register with the courts and to keep the notarial monopolies will face most problems in reforming their registration services to keep pace with the technological possibilities of e-commerce and e-government. Inclusion of 3D properties is also an upcoming issue. In a somewhat longer perspective the European single market will have a significant impact on the laws and systems supporting the land market. An open mortgage market may be the first to push towards harmonising the registration services. Former socialist countries in East and Southeast Europe have undertaken or are still undertaking huge projects for restitution of private ownership and in building registration services for the emerging land market. Most of the transition countries return to old pre-socialist systems - including re-establishing a monopoly for notaries to prepare documents for registration. 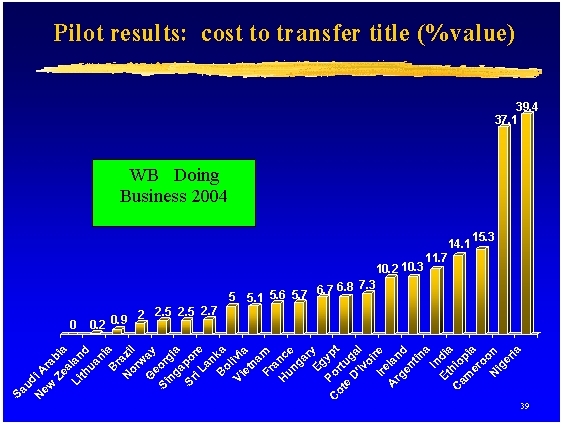 In these countries the notarial fees add considerably costs to property transactions. A number of transition countries made more radical changes establishing from the beginning a single agency for the cadastre and the land register, and Romania has just decided to transfer the land register from the courts to unify it with the National Cadastre Agency. Experience show that the juridical sector has more problems in adapting to modern user service standards and register technologies. The land markets, particularly in apartments are evolving quite rapidly, and so do the mortgage markets in many of these countries. However, in some countries, or rather at some courts, it may still take several years to register a deed. Many transition countries in Europe have still to sort out and distribute ownership to land in urban areas. Another big issue is the management of multi-apartment blocks where the apartments are privatised without ensuring a proper system for maintaining the common parts of the buildings. That may potentially result in big social problems in these countries. It seems to be a trend that the countries prioritise rural areas rather than the cities, where indeed the most active land markets are. The IACS and INSPIRE initiatives of the European Union, very much linked to the agricultural and environmental policies, could further lead to prioritising rural areas before areas where an active land market could contribute most efficiently to economic growth. In developing countries customary tenure systems calls for special solutions, including registration of different types of right to land, group rights, gradually improving tenure rights, etc. However in the cities and in the fast growing informal urban settlements, individualised ownership rights or long leases are appropriate tenure systems. Formalising property rights in developing countries calls for solutions that are tailored to the needs of the poor dwellers and small businesses, also to keep their property inside the formal system once registered. Fundamental reforms to the property system are needed in many countries, including distributing land from a rich elite or the state to the poor. 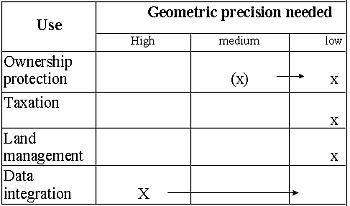 Surveyors have traditionally engaged in the definition of the property objects only – in the green box. 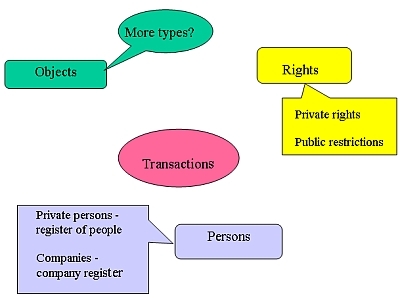 To make a better contribution to the overall objective – a well functioning land market for all – surveyors have to engage in all the services that support the land market, including registration of rights in property (land register) and in ensuring that the subjects – persons and companies - really can act in the land market. In addition we need to respond to the continuously changing demands from the land market, such as “producing” the types of property objects that the market would like to make transactions in at any time. 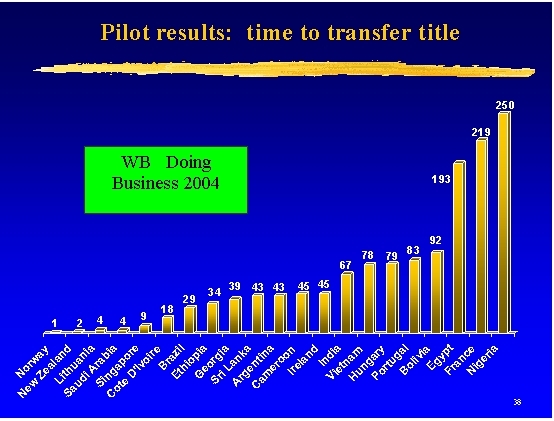 Our success will be measured by such data showed in the below figure from the World Bank report on Doing Business 2004. 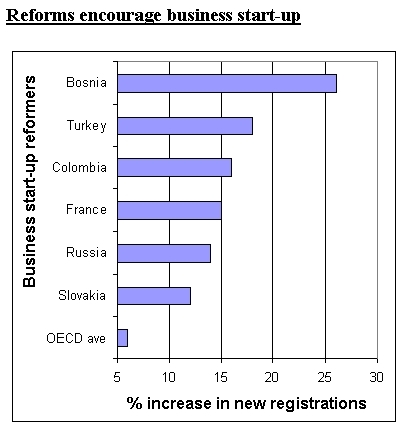 The increase in registration of new companies is obviously related to a number of factors outside the functioning of the land market, but it illustrates the performance indicators surveyors need to respond to. 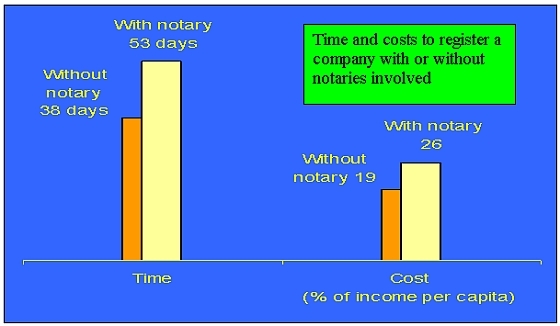 The illustration concerning registration of companies shows that notaries add cost and time – the same could certainly be said in relation to land transactions. Should private investors be welcomed to take part in cadastre and land registration, could private companies operate registers? P. O. Box 8120 Dep.